I am a huge fan of Robocop. And I have been as along as I can remember. People ask me what my favorite movie is. Robocop. No hesitation. It's great stuff. So, when I heard that it was being remade, I was excited. Now, I am a fan of remakes; so I was interested in seeing how the classic would be updated. I debated on whether or not I should watch this trailer. Sometimes I don't watch the trailer so nothing in the movie is given away or so I don't have any preconceived notions. But, I can't resist Robocop, so I watched it. And I have never been so nervous watching a trailer before. And HERE is said trailer. And I really liked what I saw; though it will take some time getting use to Joel Kinnaman as Robocop instead of Peter Weller. (But, in his defense, Weller only played Robocop in 2/3 of the movies and none of the tv shows). I liked the design of the suit. It still is undeniably Robocop, but sleeker, more modern. I also liked the nod to the original suit, with the gray color scheme before they paint it black. 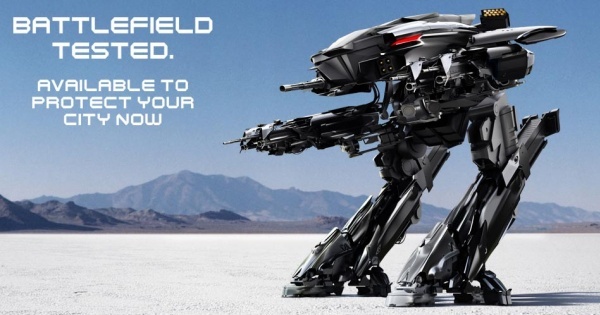 I feel the same about ED-209: still looks like ED, but different. And Gary Oldman is in it; he's badass. But I wonder who the bad guy will be. In the original, it was Clarence Boddicker, played brilliantly by Red Forman. He added a whole other something to the original film. But here, at least judging by this trailer, there doesn't seem to be a "villain". It seems to focus more Murphy becoming Robocop. And that is one of the things that excites me about this movie. It appears that the film will explore more of Robocop trying to find equilibrium between his past life and his new. Making his wife aware that Murphy is Robocop is an interesting choice and I'm eager to see how that plays out. Also, the whole "who is in control" thing could be intriguing. Anyways, I am super excited to see this movie. I love Robocop and am curious to see a new interpretation of him. However, regardless of how good the remake actually is, Robocop is awesome and always will be. (Except for the part of Robocop being awesome. That's pretty much fact).